Since its earliest days, science fiction has explored the notion of a walking, talking, thinking machine, reflecting back our own humanity through their glass eyes, exploring their own humanity framed in the symmetry of programming and gears, trapped in a cage of synthetic flesh and metal bone. What happens when what we’ve made in our own image becomes more like us than we ever imagined? Robots in love. Robots at war. Robots who weep and dream. Robots who aspire to be on equal footing with their makers…or even possibly exceed us. 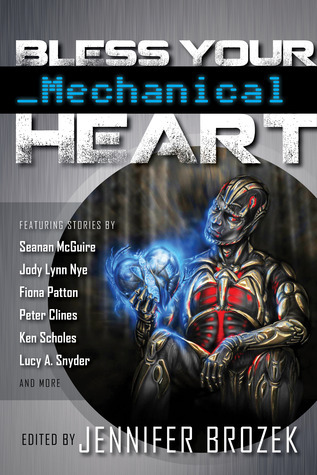 In Bless Your Mechanical Heart, Award-winning editor Jennifer Brozek brings together a team of writers, both new and established, to explore one of the most enduring archetypes in the science fiction genre with a tip of the hat to one of the most endearing and versatile phrases in Southern culture. Featuring stories by Peter Clines, Jody Lynn Nye, Seanan McGuire, Fiona Patton, Jean Rabe, Ken Scholes, and Lucy A. Snyder.